Are you in need of a Beaverton roof estimate for a roof that needs to be repaired or replaced? West Coast roofing provides our Beaverton customers with detailed roof estimates so that there are no surprises when it comes to financing the replacement or repair of your Beaverton area roof. A Beaverton roof estimate from West Coast roofing includes a thorough listing of every expense involved in your roof repair or replacement project. The size of your Beaverton roof project doesn’t matter. Big or small, all of our Beaverton roof estimates provide the detail you need to be confident in moving forward with your Beaverton area roofing project. At a minimum, every Beaverton roof estimate from West Coast Roofing will include start and completion dates, a list of materials required by your roofing project and their cost, payment due dates and options, and a list of workmanship and manufacturer warranties. And if your specific Beaverton roof estimate requires additional information, we’ll include those details. But more importantly, we’ll be willing to explain every aspect of your estimate and answer your questions about each item listed on the roof estimate for your Beaverton roofing project. 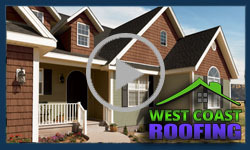 At West Coast Roofing, we believe providing our Beaverton customers with detailed roof estimates. Beware of other contractors who will exclude important elements from your Beaverton roof estimate in hopes of winning the contract by offering you a lower bid and surprising you with additional costs later! We don’t believe in surprises when it comes to providing you with a reliable Beaverton roof estimate or completing your Beaverton roofing project. To provide you with an accurate roof estimate for the repair job on your Beaverton home, we’ll first need to thoroughly examine the condition of your roof. We take the time to get up on to your roof and take detailed measurements so that we can provide you with accurate roof estimate. With a detailed estimate that outlines the materials and costs you can rely on, to make your final roofing project decisions. And of course, cost is only one aspect to consider when comparing multiple roof estimates for your Beaverton area home. Equally important things to consider are the quality of roofing materials, thickness of any insulation required, the length of the manufacturer’s warranties, and whether the contractor plans to dispose of the waste from your Beaverton roofing project after completion. Along with your detailed Beaverton roof estimate, you can expect top quality performance from West Coast Roofing. The quality of your roofing installation is perhaps the most important factor in reviewing a roof estimate for your Beaverton roofing project. Installation errors or shoddy work can greatly impact the longevity of your roof and the success of your roofing project. You can trust West Coast Roofing to give you an outstanding result for your Beaverton roofing project. Are you in need of a Beaverton roof estimate for the repair or replacement of the roof on your home or business? Contact West Coast roofing today for a detailed and accurate roof estimate for your Beaverton area roofing project!